Fox 6 TV of Birmingham recently aired an interview spotlighting our Cleaning For A Reason program. It was an awesome news segment because it gave one of our patients a chance to share her story. Cindy Williams is an awesome person and we pray that she'll have a quick recovery with her battle with cancer. We've loved helping her with her house cleaning needs and we're better people by knowing her!! 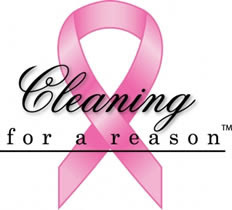 Check out Cindy's story here & check out the Cleaning For A Reason website to learn how we provide free housecleanings for woman undergoing cancer treatments. Moving To Our New Digs in Panama City Beach!! We've recently relocated our office in Panama City. Our new office is located "On The Beach" & our employees can't wait because they'll now be able to hit the beach after work this summer!! Just kidding, our new office is much better geographically suited for our client base and it's 100% nicer too!! We're all excited about the move but not too excited about the moving. Of course, our office manager - Rachel - looks pretty happy to be moving those boxes doesn't she?? We'll still cover all of Bay County, including Lynn Haven, Panama City, Callaway, Tyndall & Southport - and "The Beach" too! !